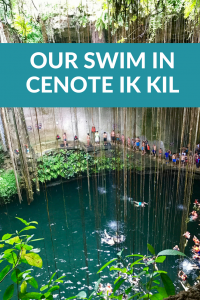 I had no idea what a cenote was before our cruise to Mexico. 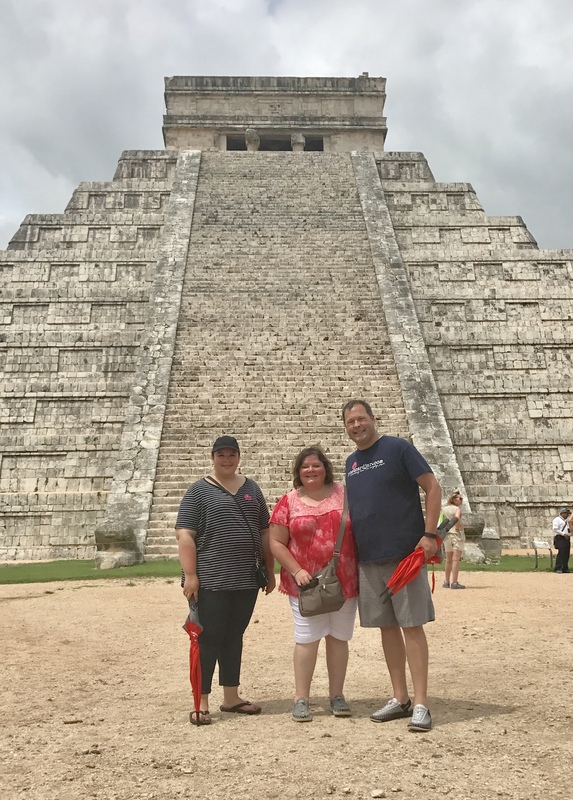 With our daughter, Meghan, at Chichén Itzá in Mexico. In fact, I don’t even think I’d ever even heard the word. But I signed up to swim in one, anyway, because travel is about adventure, right? 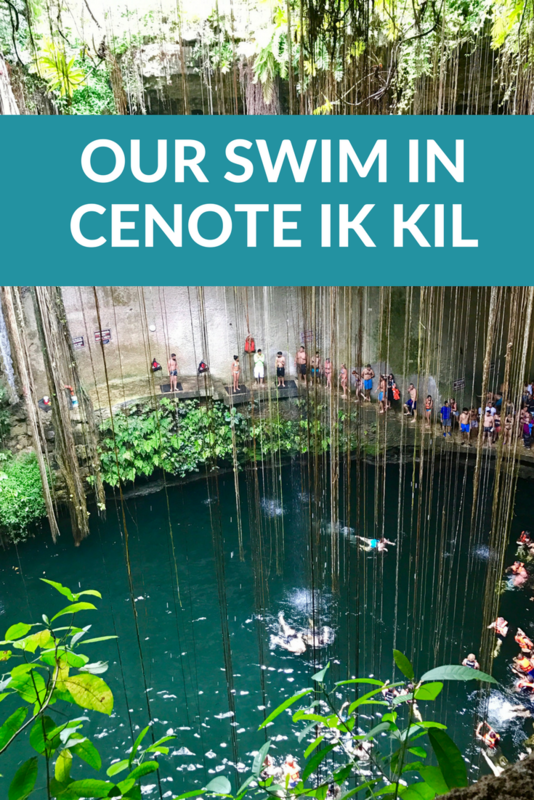 After leaving Chichén Itzá, we made a short drive over to Cenote Ik Kil. On the way, our guide explained that the Yucután peninsula is made of limestone covering a system of underground rivers. 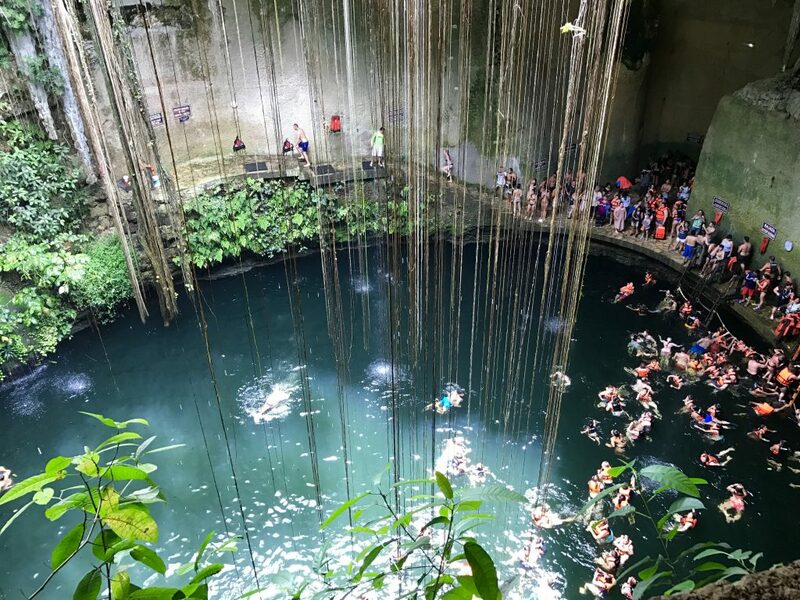 Over millions of years, water has eroded pockets from the limestone and created huge sinkholes, called cenotes, that can be hundreds of feet deep. Civilizations in the past used these as both sources for water and as handy places to sacrifice someone to the gods. He told us that the one we’d be swimming in today was literally hundreds of feet deep and suggested that even if we were good swimmers we might consider using a life jacket as there was no way to stand once in the water. 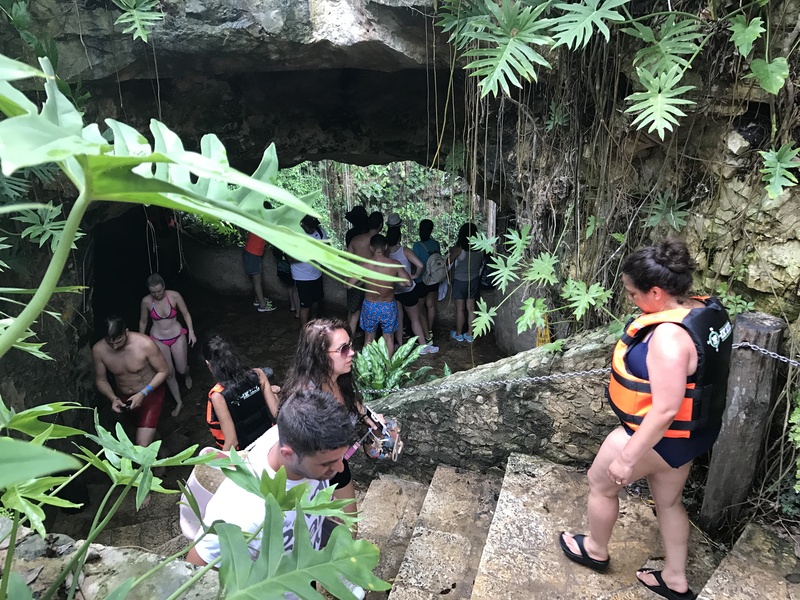 We walked down a long, and sometimes slippery, staircase to enter the cenote. Because there were a lot of steps down to the cenote, Ann opted to stay up high and take pictures from a balcony while Meghan and I swam. 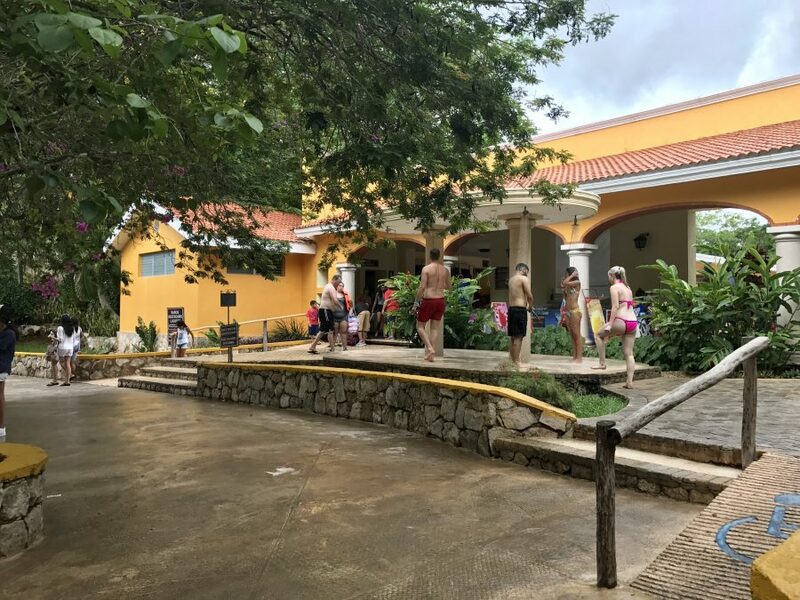 After changing into our suits in a locker room contorting our bodies into our suits in a steam bath with no benches, we left our personal belongings with Ann and headed down the somewhat slippery stairs to the cenote. 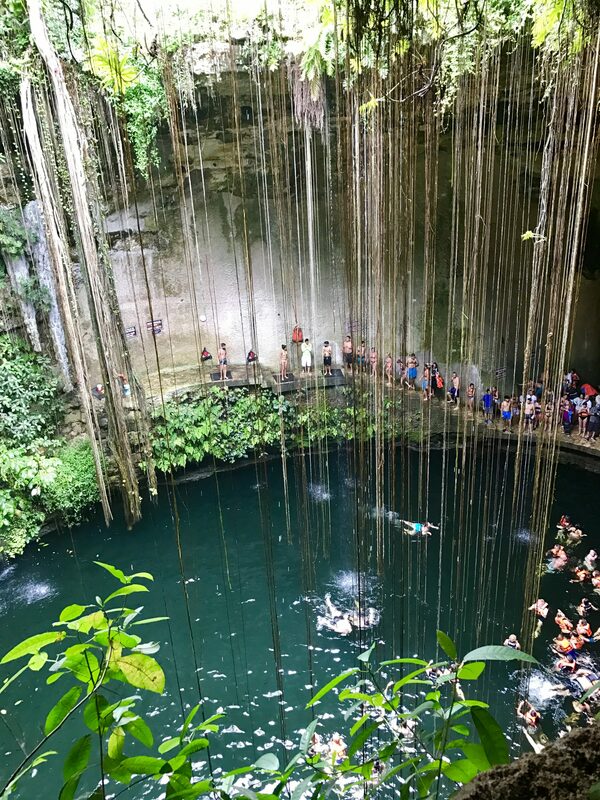 I will say that the cenote was beautiful and I could imagine it would be as stunning as it was in the pictures on the website if there hadn’t been about 52,000 people swimming in, climbing out of, or standing around it. Swimming in Cenote Ik Kil in Mexico. Note the line of people waiting for the ladder on the right side of the picture. Still, we donned our life jackets, jumped into the cool water, and paddled our way past the mass of wiggly humanity out to the middle where we could relax a little and enjoy the experience. After a few minutes, we decided we’d done all the enjoying of the experience we wanted, and paddled back into the swarm of people to get out. The hardest part of the whole swim was waiting for a turn on the ladder to climb back out. 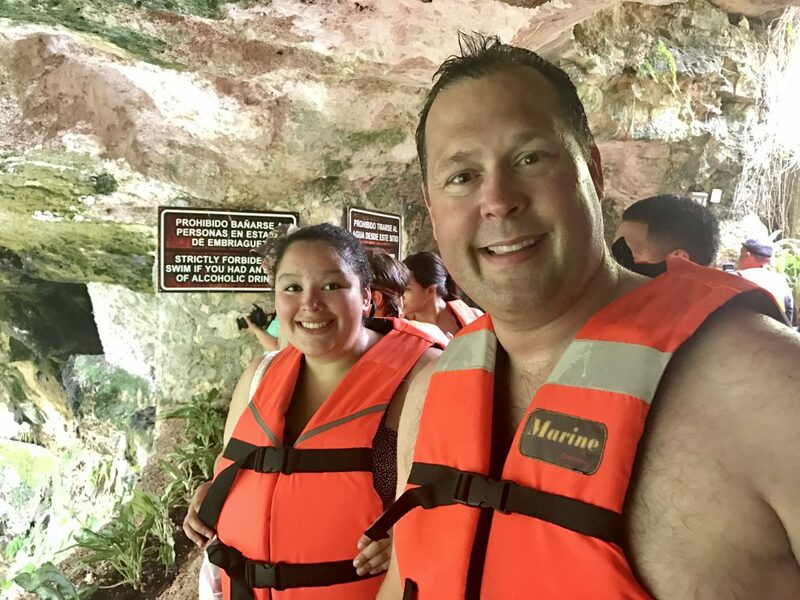 Meghan and Steve ready to swim in the cenote. Back on solid ground, Meghan waited while I climbed some steps to a ledge where I could jump in from about 20 feet above the water. There were lifeguards on duty, and as a former lifeguard myself I felt pretty confident, so asked Meghan to hold my life jacket because I didn’t want to wear it jumping into the water from that height. It was a fun jump, but the line for the ladder to get out was now even longer than when we’d gotten out before and I had to tread water for longer than I would have liked while waiting my turn. As a result, I’d recommend a life jacket for everyone who swims here no matter how strong a swimmer you are. There really is no place to go to rest if you get tired. Ann stood at the top over a lookout area and took pictures. Feeling cool and refreshed after our swim, Meghan and I climbed the steps away from the cenote and back toward where Ann was waiting for us. By the time we got back to the top of the steps, the heat and humidity had set back in and I was again covered in a sheen of sweat. There were showers where we could wash off a bit at the top of the steps. While we no longer felt refreshed, we were glad to have had the experience of swimming in such a unique location even if we had to share it with 52,000 new friends. Swimming in the crowded cenote. 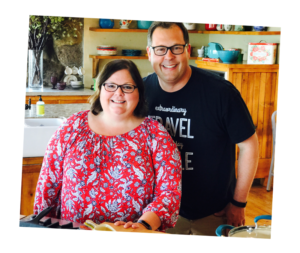 After changing pasting our clothes back to our bodies, we hopped back in the thank-god-it-was-air-conditioned tour van and set off toward Progresso and the ship, our minds processing a full day of sights, new knowledge and experiences. We’d had a great day, and were looking forward to a relaxing evening on board as we sailed to the next stop, Cozumel. 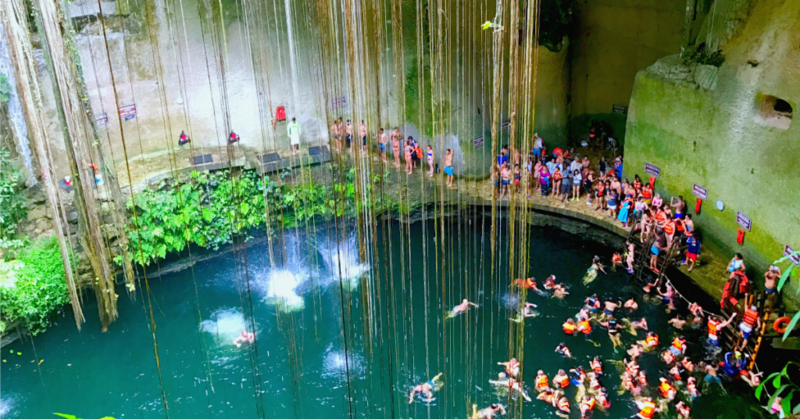 Have you ever swam in a cenote? Let us know, we’d love to hear from you. 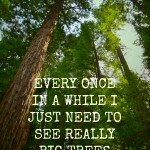 Thanks for sharing and Pinning!